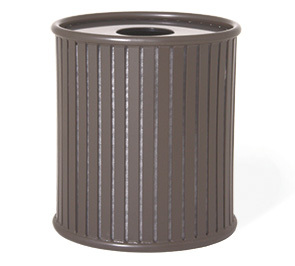 Coordinate with the look of modern landscapes and architecture, the straight forward contemporary design of the Augusta Collection 36 gallon capacity trash receptacle fits in anywhere. Developed to meet the variety application specific requirements, the receptacles are offered with a choice of flat top, rain bonnet and ash urn lid to maximize disposal access and properly conceal contents. Ready for continued exposure to seasonal elements, the Augusta Collection receptacles are engineered with commercial grade materials, finished in an ultra-resilient powder-coating. Liner is included and the built-in tabbed footings accommodate for both surface mount installation and portable capabilities.